I realize we’re now half-way through 2018, but I never provided a full update of our tax situation from 2017! The news is mostly good…..but a little “mixed,” I guess. In 2016 we messed up badly. During that year, hubs was still fully self-employed and although I had a full-time job where taxes were withheld from my employer, I also still worked part-time in a contract position where taxes were not withheld. Long story short, we WAY underestimated our tax payments. Come tax time, we were hit with a MASSIVE (like, felt insurmountable) tax bill. 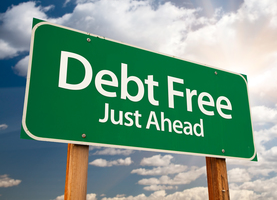 On advice of our CPA, we tried to fight a portion of the tax bill and it took 6 MONTHS of back-and-forth before we were finally able to come to an agreed payment plan. I’ve never revealed the exact amount of back-taxes mostly due to embarrassment. I did say that the payment plan we settled on will have us paying $283/month for….basically forever. A long time, okay? ANYWHO….. The 2016 tax experience scared the pants off of us and made me extra cautious in 2017. I knew I was withholding more from my paychecks than necessary, but I wanted to err on the side of caution. 2017 had a lot of big changes for us: hubs closed his business and went back to school full-time. I had to leave my part-time job after getting a big raise at my full-time job and having to sign a non-compete agreement. All these changes made it so I wasn’t quite sure what to expect come tax time. Again, we used a CPA. I gave him all our stuff and held my breath, biting my nails, until taxes were complete. For some reason, I was still expecting we’d owe money. I was just hoping it wouldn’t be too much. When taxes were done, I couldn’t believe the end result. We were owed a refund! I’m using round numbers here, but we had overpaid our federal taxes by about $400 and had overpaid state taxes by over $800!!! This was a HUGE relief for me! I knew the federal overpayment would be applied to our back-taxes, but I fully expected (naively) that the state refund would still come back to us. I checked online a couple of times to try to verify the refund, but the online system just said that due to the high volume it was taking longer than normal to process tax refunds and to wait 8 weeks before calling to inquire further. So here I am, thinking I’ll get a check in the mail and it’s just going to take awhile. Spoiler alert: I did not receive a check in the mail. Instead, I received this letter in the mail. By law, we must offset any refunds or overpayments to certain government agencies. Of course they do. 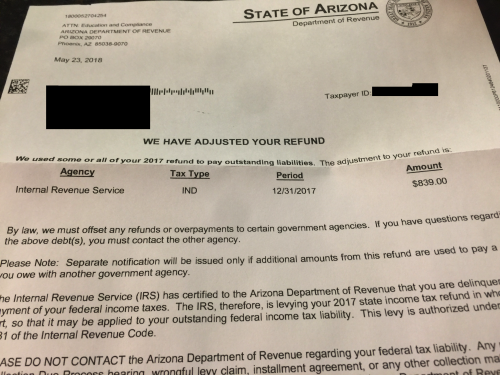 They had to use the refund to pay for our 2016 back-taxes. I should’ve known this would happen. For some reason (false hope), I really thought we’d get the state portion of the overpayment back. But nope. It goes straight toward our past debt. Would’ve been nice to use that money for different, higher-interest debt. But I get it. It is what it is. No refunds for 2017. But no additional tax liability either. Now that our work situation has stabilized a bit (hubs now goes to school AND works part-time as a personal trainer where his taxes are withheld & I still just have the one full-time job where taxes are withheld from my paychecks), I feel safer to adjust my withholdings slightly so I will get just a tiny bit more per paycheck. Overall, we’re in a pretty good place. I don’t want to overpay in taxes (especially since I now know for 100% fact that we aren’t getting any overpayments back!!! ), but I also don’t want to be short and end up owning money either. We should be in pretty good shape to be right about $0 owed or overpaid for 2018. We’ll check-in with our CPA again in a couple months just to make sure everything looks good and to see whether he suggests or recommends any additional changes to our check withholdings. With any luck, we can come in right about even for 2018 taxes. Fingers crossed! How did your 2017 tax situation work out? If you received a refund, what did you do with it? Before you adjust, you should go the IRS site and see how the new tax plan will affect you. you can google the link. You will need l2017 return plus current pay stubs for the calculation. With personal exemptions going away and possibility of not itemizing, it is less than certain how a family of 4 or more will fare. We came out ok (family of 4), benefitting from the $2k per child tax credit. Without that, I would have been a little short. This is great advice. The loss of the personal exemptions is huge, but hopefully your child tax credits will make up for it. My childless friends and those whose kids are grown are seeing their taxes go up significantly. I would seriously consider doing your taxes using low cost tax software now that you are a totally W-2 family in terms of income. You don’t have the extra cash to pay an accountant. On the bright side, you’ve just made 3.5 additional payments toward that debt. I am sure there are things your would rather have used it for, but thing of it as a mini snowball payment. You should check with the IRS and be sure you were correctly credited for this amount. Sometimes when the state sends them in they get lost in the shuffle. Ask me how I know.